The Limited Edition Angel mask is something rather special & just right for a lady to wear to a ball. Beautifully embellished with genuine Swarovski Crystals, this Limited Edition designer Venetian masquerade mask (only 25 ever made) brings the glamour and intrigue of the Carnival of Venice to your own themed event or masked ball. A work of art on a base of lace filigree provides a graceful setting for a collection of Swarovski crystals, sparkling above the eye. You will feel excessively feminine in the flattering Angel masquerade mask. Wear the Angel to your next masquerade ball themed party and take on the charm and grace of traditional Venice. It is designed to create a beautiful impression with your masquerade costume or evening gown. The Venetian masks you buy from us are made and decorated by hand in Venice. When we say genuine what do we mean? 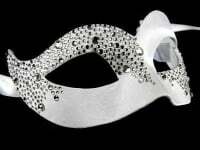 Your designer Venetian Angel mask, from Simply Masquerade, is made in the original 16th century design using the same methods by artisan mask makers in Venice. Buying one of our authentic hand made masks in favour of mass produced or machine made versions helps to keep alive the mask making tradition and skill which originated centuries ago, and is still being learnt by apprentices in Venice today. Masks, in their making and their wearing, have played their part in the history of Venice. The masquerade mask became a symbol of Il Carnevale - the Carnival of Venice - in medieval times and remains so today. Over the centuries, artisans acquired and sustained the skills to create brightly coloured masks of legendary characters for the annual Carnival season. Eventually Napoleon put an end to the festivities were stopped and the Carnival was over – at least until 1979 when a one-time carnival sparked a revival. The long lost tradition of mask making started once more and the Carnival became the famous extravaganza it remains today. Why not bring the intrigue and beauty of a real Venetian mask to your masquerade ball or themed party? Order your Angel today and we’ll deliver it free.